Inspired Press: Today's share brings the number of classes to 10 for 16-Bit Adventures. Today's share brings the number of classes to 10 for 16-Bit Adventures. In this case the picture is of the Goblin Family. You can see there are only four of the evil, little buggers but no doubt you will encounter many dozens of each of those in your own adventures. Goblins are an example of a quick monster. They have low HP and DMG but high EVA and Agility. They aren't particularly smart, not personable nor strong, all they really have is their speed and the power of the punch. Their normal attacks are really nothing to fear. Most of them will hit the Party Leader (ie the tank) and they are not good at hurting anyone in heavy armor. Even a higher level Goblin is nothing to fear if it sticks to normal attacks. The catch of course is Goblin Punch. Zoom in on the pic above (or click on the link to it at the bottom of this entry) and you will see that Goblin Punch throws a lot of dice. 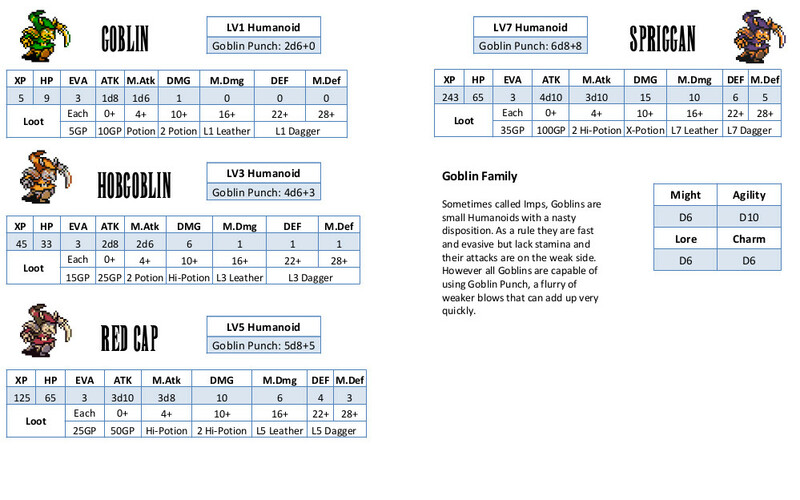 the individual hits are still weak, in fact they are weaker than the Goblin's normal attacks, but there are lots of them. And that means lots of chances for them to crit. Due to their low HP, Black Mages find Goblins to be excellent target practice for trying out their AE2 spells. For ease of editing I am now handling each section of the 16-Bit Adventures rules as its own document complete with copy-pasta front page. This allows me to more easily focus on one aspect of the game and in the last week that has been Monsters and Job Classes. The monster chapter isn't even close to done which is why I've only shared a single page, but the JC chapter is perfectly usable and is included in this week's links. Rather than sticking two different classes on one page and then doing the same for their character sheets the new method is to put the sheet and class info on one page and then print the entire thing for play. This gives the player a reference since all the rules for their abilities are on the sheet and also let's them salivate over what is to come as they level. The sheets themselves are much improved and now have spaces for such things as XP and GP.